In this tutorial, we’ll walk you through how to sew wide waistband elastic (or plush waistband elastic) in the inside of a garment waist instead of a casing. We’ve put this tutorial together as a fun hack for the Citrus Leggings, but you can apply it to just about any skirt or pants that uses an elastic waistband. No need to use an elastic the same width as your pattern since we don’t use a casing. Start by cutting a piece of wide waistband elastic to length. Abut the ends and use a wide zig-zag to sew them together. (I used a contrasting thread so you could see what I was doing, but you’ll probably want to use a matching thread as this stitching is visible in the finished garment). This elastic is 2″ wide. You can use anything in the 1-2″ range for this treatment. 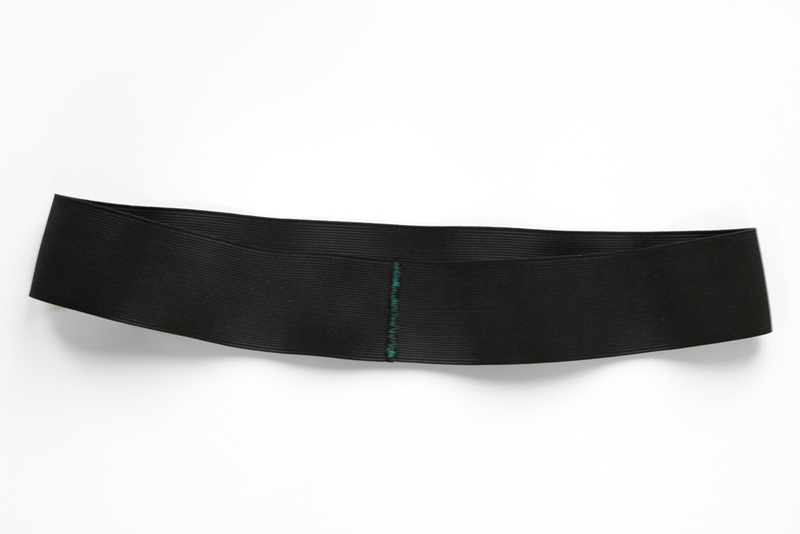 “Plush back” elastics are especially nice because one side has been brushed to be extra soft against your skin. Before sewing the elastic, you’ll want to consider the finished height of your garment rise. With the Citrus Leggings, the top 1″ is folded inside to create a self-fabric casing. That means that if we sew our wide elastic to the top of the raw edge then we are raising the height of our leggings rise by 1″ (minus our seam allowance) so we’ll want to trim off 3/4″ from the top before sewing the wide elastic. If your pattern calls for a separately attached waistband then your rise will end up lower because you don’t have the height from the waistband being added unless you add extra fabric to the top of your pattern pieces when cutting them. (If you don’t care about exactly where the waist of your garment hits, then you don’t have to worry about this!). With the right side of your elastic against the right side of your fabric (your elastic may not have a right and wrong side if it isn’t plush back), sew the elastic to the top of your garment using a 1/4″ seam allowance, stretching the elastic or garment as necessary to fit. Flip the elastic to the inside. The 1/4″ seam allowance you sewed is now the bit of fabric that flips to the inside of your garment waist. Tack the elastic down by sewing along any seamlines you have (making sure to use a stretch stitch). That’s it! Aaah! I’m having an epiphany moment. I have a wool jersey dress that I need to cut into a skirt. And some super-fun plush elastic that I was going to make into a featured waistband, but I pretty much don’t like the way contrasting waistbands look on me. This weekend, mark my words.